My reasons for wearing this dress last Sunday were threefold. First, it was my husband's grandma's 91st birthday and I knew she would like the floral print. Second, apparently last Sunday, unbeknownst to me, was my first anniversary of my "relationship" with Boden and this dress is from Boden. They sent me a sweet, dare I say creepy, email reminding me that one year ago I made my first purchase from them. (And clearly they wanted me to make more!) Last of all, for whatever reason, the pink and green colors of this dress also remind me of jockey silks for racing, and since it is almost the Kentucky Derby, this would be a good "Derby Day" dress, sans the ostentatious hat. Believe it or not, I actually cooked in this dress. Please note that these pictures were taken before I started this process. With my apron on, pearls, and this fit and flare style dress I felt sort of like a 60s housewife. The only problem was the next day I had to go to work! Also, as a side note, I am beyond thrilled to be featured as head stylist on Lauren's blog, Style Elixir, which you can check out here! 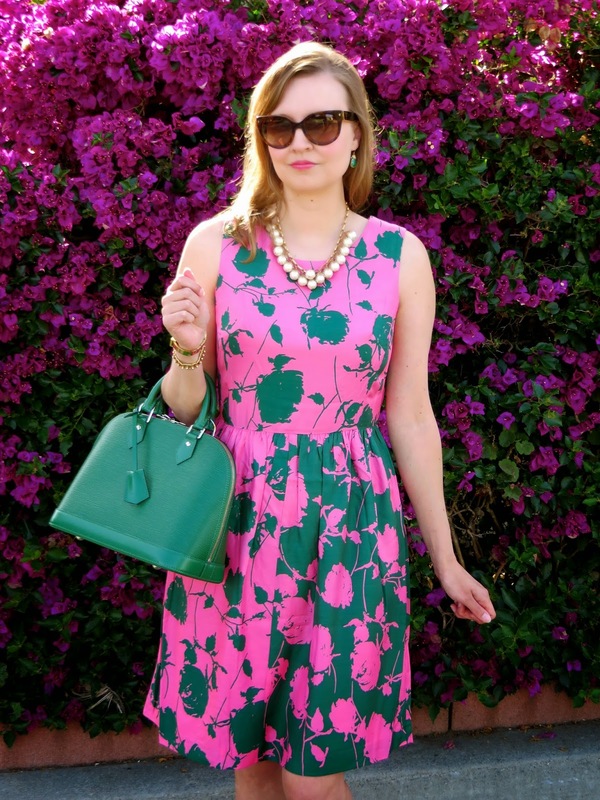 That dress is gorgeous, never seen bright pink paired with emerald before - I must try it. Congrats on being the Style Editor on Style Elixir, today. I had no idea you were an English teacher. I teach a couple of English classes myself, to young children and to adults (who are Albanians; I teach ESL). Have a great day Katie! <3 Ada. I also didn't know you taught English! I guess it's a small world! Beautiful dress! I love that colour combo - and your bag is an absolute beaut! Thank you! I also adore pink and green together! You do have the best bags too, love this Epi! 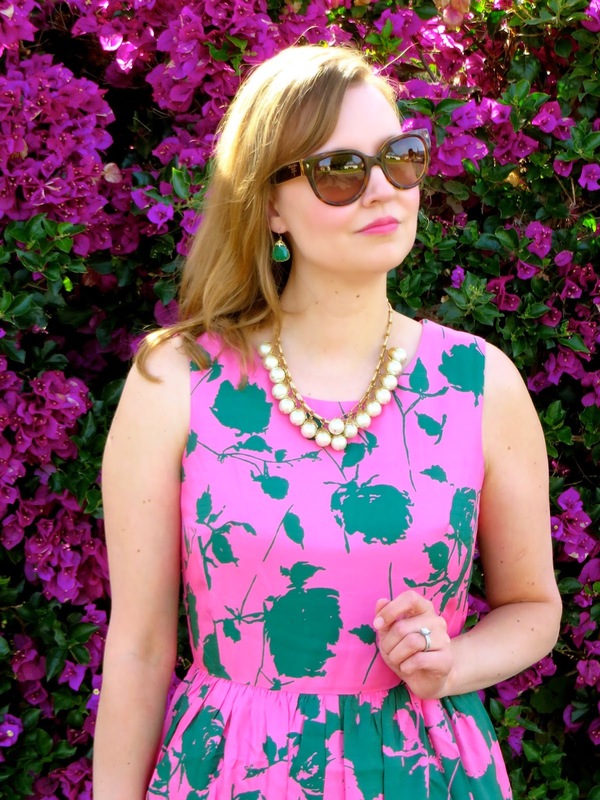 The color combo of green and pink in this dress is gorgeous! Thanks! I am just a "tad" addictive to LV's Epi leather. Thanks for hosting the link up! Love this look (it's especially perfect against that bush!) All-around perfect outfit, from your sunglasses to your sandals! Thanks Sophia! Yes, this happens to be a very convenient place to take photos! Very pretty dress! Like this look! Thanks Alyssa! I get so much use out of these sandals in the summer. They go with everything! The colors on the dress are really cool. Pink and green is one of my favorite color combos. Thanks, the colors of the dress are definitely what I was attracted to. 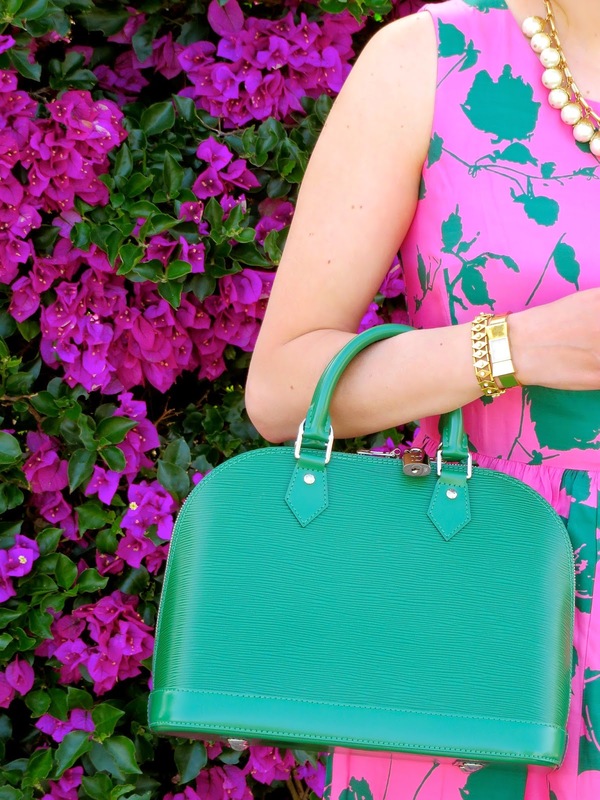 You can't go wrong with pink and green for spring! This dress is really pretty. What a strange email from Boden too. Thank you Ginny! Yes, I thought the email was cute, but a little strange too. I am always amazed at the lengths retailers will go to for sales! Loving the pink, green, and gold- you look fabulous!! How does this dress fit? We have a wedding to go to at the end of the month and I'm thinking of ordering it. Thanks!! And you look beautiful in it!